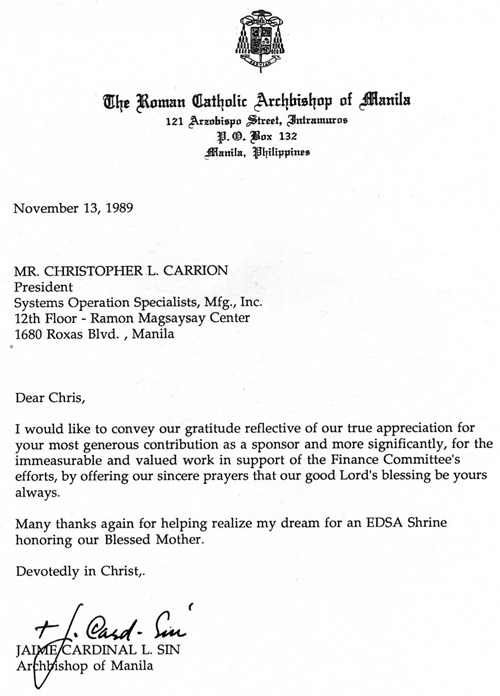 CHRISTOPHER L. CARRION, Founding Chariman & CEO of a few companies that have pioneered in the introduction of the latest technologies being utilized today and established telecoms infrastructure milestones n the country, such as, the first Philippines satellite launch, and the first SMS or text messaging technology, among others. 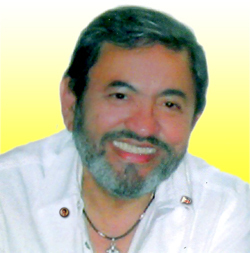 Humbly began as a working student as Office Manager in ITR Machines – Philippines (Systems Division of IMB) and promoted to Admin/Finance Manager then General Manager and later CEO, capturing 70% of the Philippine auxiliary systems market from the 1960's to 70's. 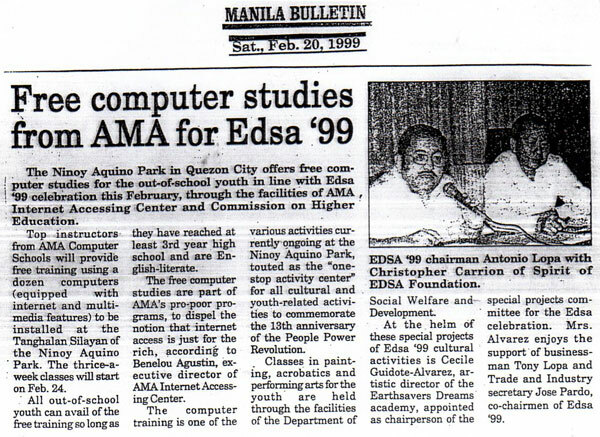 To-date he sits as well as a Board Director in the country's largest gold mining government owned and controlled corporation and in the pioneering company accredited first by the Philippine government to set-up the national infrastructure for liquefied compressed natural gas for public transport vehicle usage. He also is Chairman of an international trading company dealing in sourcing partners for alternative sources of energy production and linkages in petroleum products trading for the China market. He has shown his leadership in his early years as class president from first to fourth years in secondary level and voted most popular, amiable, sociable and active in its senior polls at the De La Salle College. 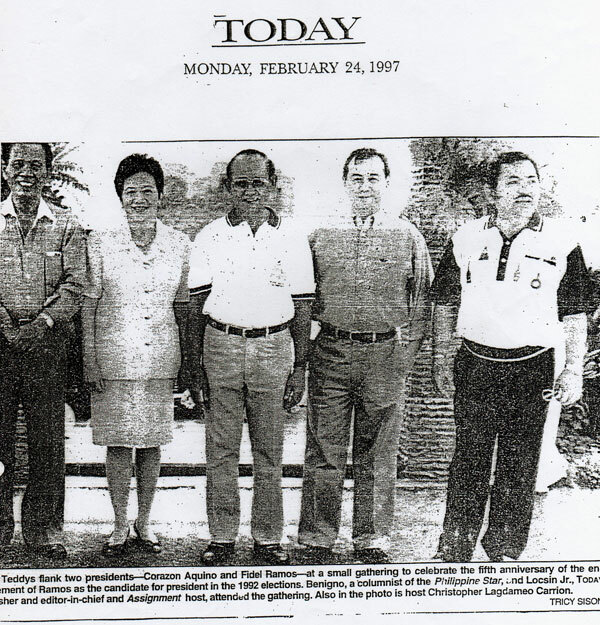 Notably, he received several awards on integrity, fairness, patriotism and humanitarianism, as further evidenced by his successful multi-year voluntary involvement in the National Peace process during the Cory administration as a Peace mediator with the MNLF-reformist group in the mid-80’s, and later served as Chairperson in various cause oriented prestigious organizations such as, the Joaquin "Chino" P. Roces Foundation, Sprit of EDSA Foundation. 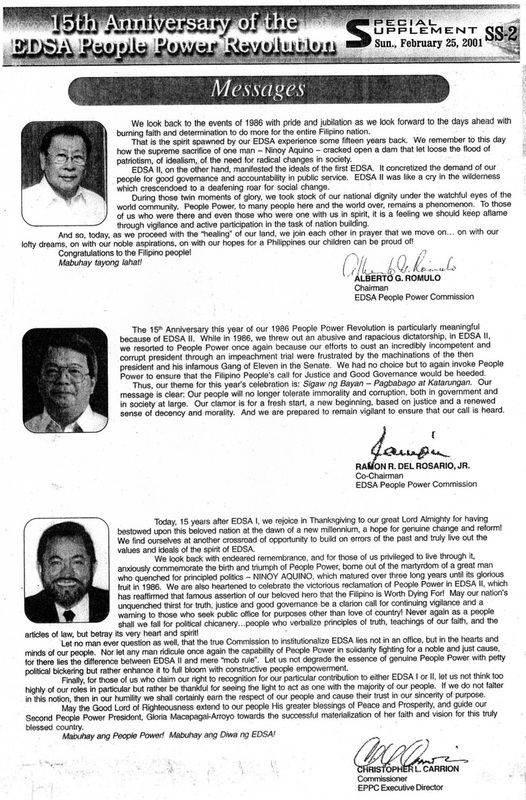 He currently continues to serve as a Commissioner and Co-Chairman of the EDSA People Power Commission created by the Office of the President. 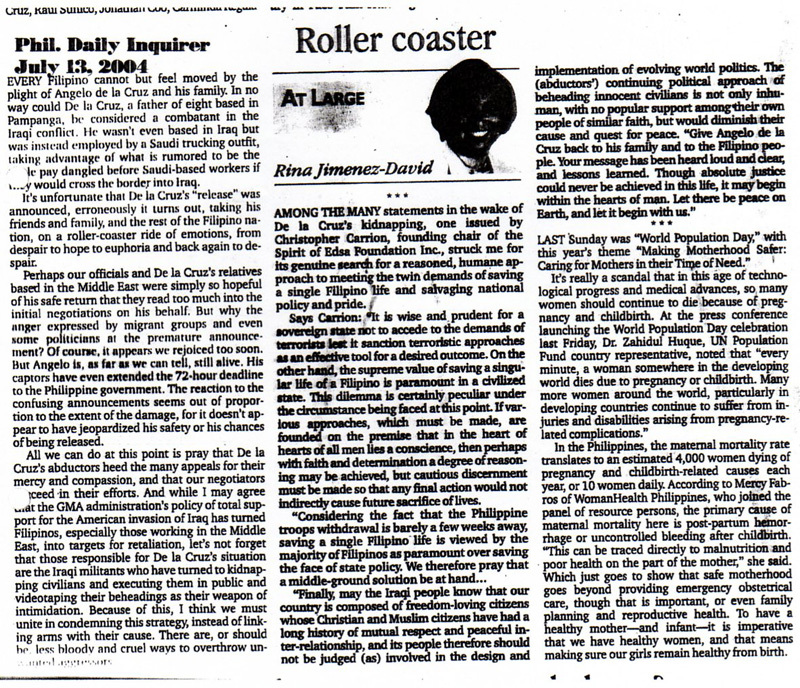 It all begun during the darkest moments of our country’s history when a energetic and patriotic businessman – Christopher L. Carrion together with his young and vibrant nephew – Ramon Z. Carrion and group of friends joined several Ninoy rallies in the Metropolis in defiance of the present administration and assisted the organization that was conceptualized by Don Joaquin “Chino” Roces known as the CORY AQUINO FOR PRESIDENT MOVEMENT (CAPM). 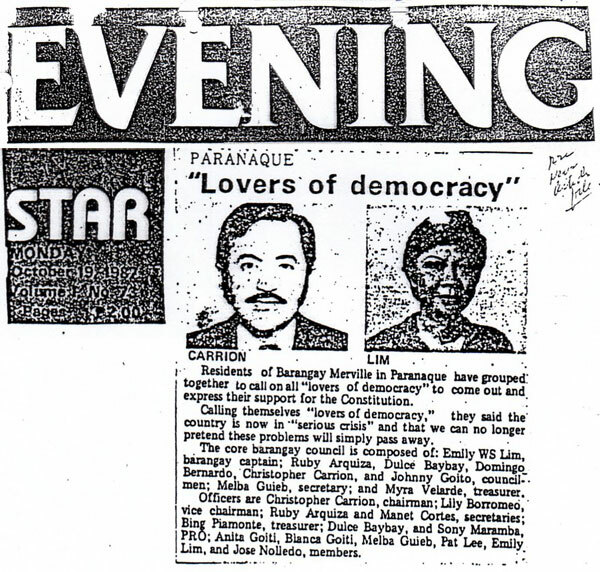 They went around the Metropolis in order to gather million signatures to convince Corazon C. Aquino, the widow of the late Sen. Benigno “Ninoy”S. 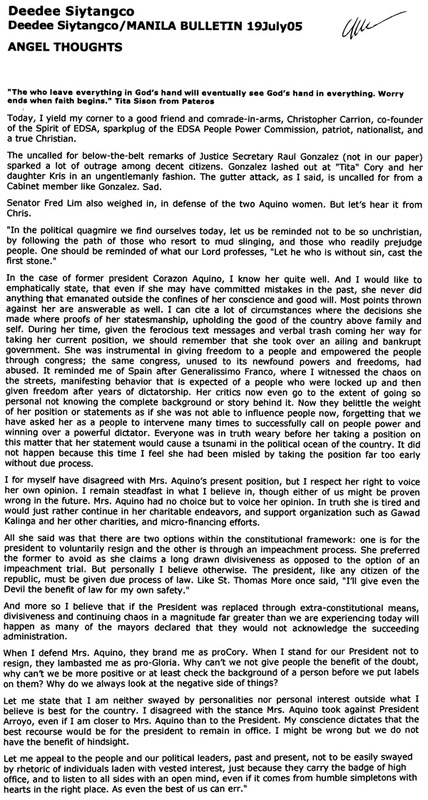 Aquino, Jr., to run for the position of President during the Snap Elections against former President Ferdinand E. Marcos, unmindful of the dangers he was facing against strong odds. 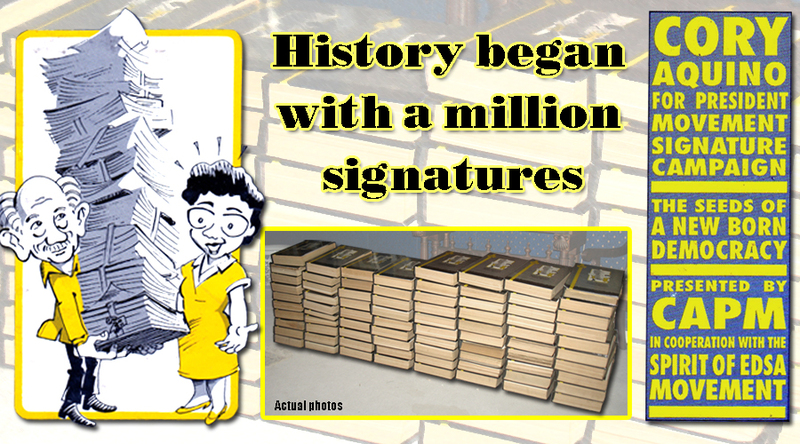 (Original historical bookbounded copies of the One Million signatures solicited are presently in the possession of Chris Carrion for safekeeping). After successfully campaigning for the signatures needed, Mr. Carrion continued his patriotic duties by helping during the Snap Elections. 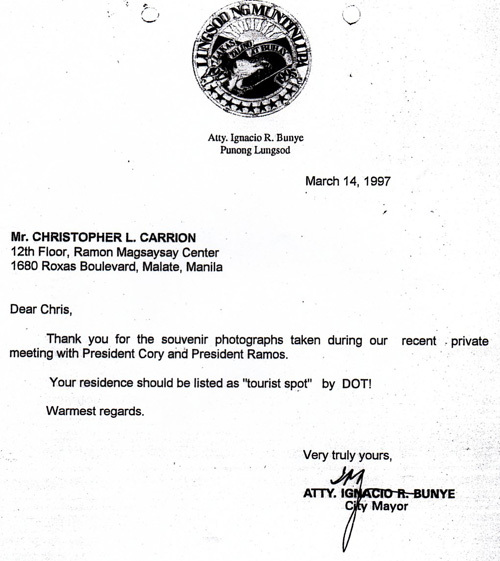 He was appointed NAMFREL Chairman at his residential place which was then at Barangay Merville in Parañaque City. As such, Chris Carrion made sure that the elections in his area of responsibility were conducted in an orderly, peaceful, clean, and honest manner and took care of having all the ballot boxes safely delivered to the Parañaque Municipal Hall. 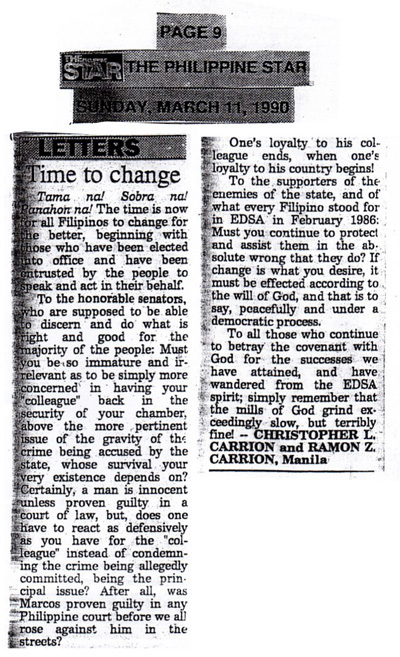 During the Presidency of former President Corazon C. Aquino, Chris Carrion formed a group known as “Buklod ng Demokrasya” continuously supported the administration. 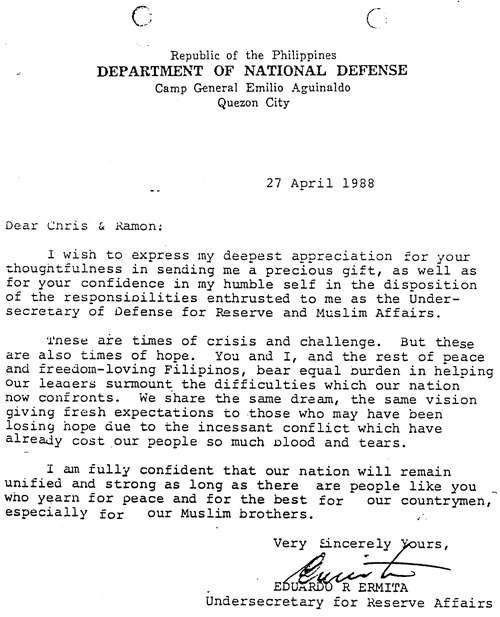 In the numerous attempted Coup-de-Tat that transpired, Chris Carrion with the help of his nephew and group delivered and donated packed foods and other essential necessities needed by the military soldiers suppressing the rebellion, then headed by AFP Chief of Staff General Fidel V. Ramos. 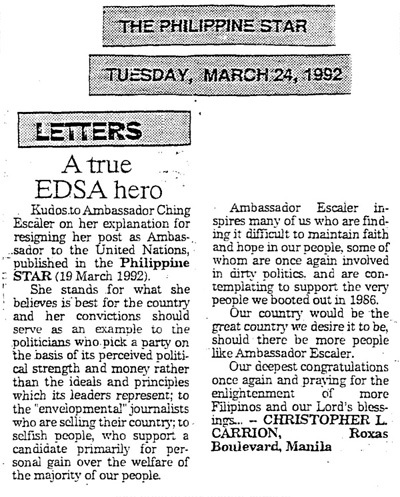 Chris Carrion likewise, wrote several articles to President Aquino for the purpose of boosting her spirit and providing moral support. 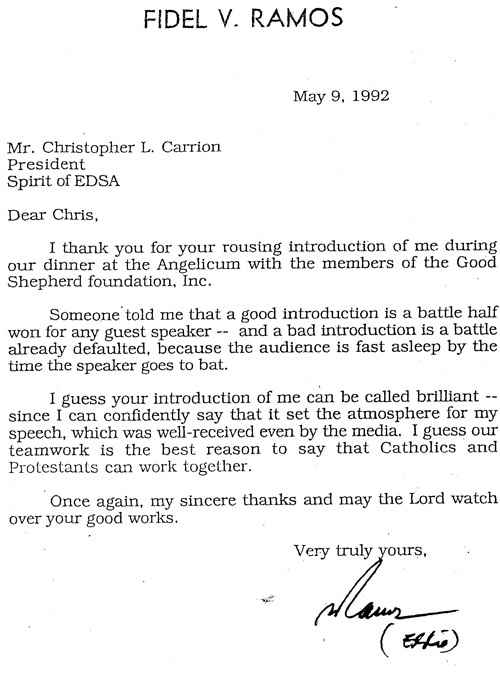 Since the majority of our countrymen, especially those who were at EDSA during those crucial 4-days (February 22-25, 1986) believe that, it would have not been peaceful and successful without the powerful intercession of the Blessed Virgin Mary, Chris Carrion, being a devout Catholic and ardent devotee of the Blessed Virgin Mary, conceptualized the idea of putting up a memorial in her honor which is now presently known as the Our Lady Queen of Peace Church or EDSA Shrine. 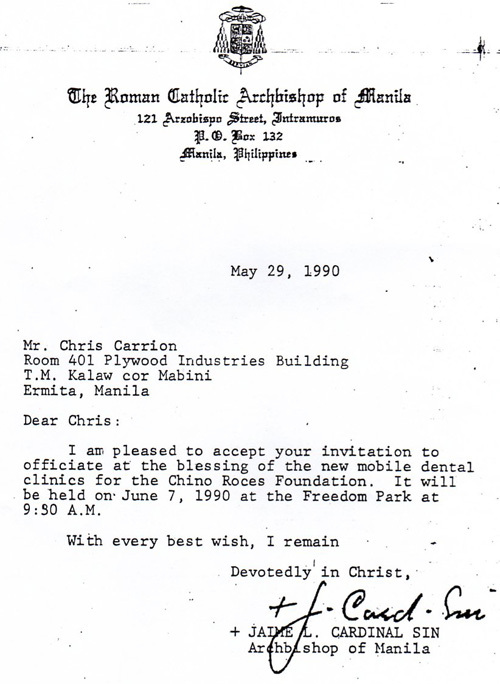 On July 20, 1986, Chris Carrion wrote a letter to former President Aquino expressing his idea followed by another letter on April 8, 1987 wherein he mentioned the objectives and justifications of erecting such a memorial, as well as, outlaying several options on how to possibly acquire the land for the agreed site and several fund raising schemes for the proposed construction. 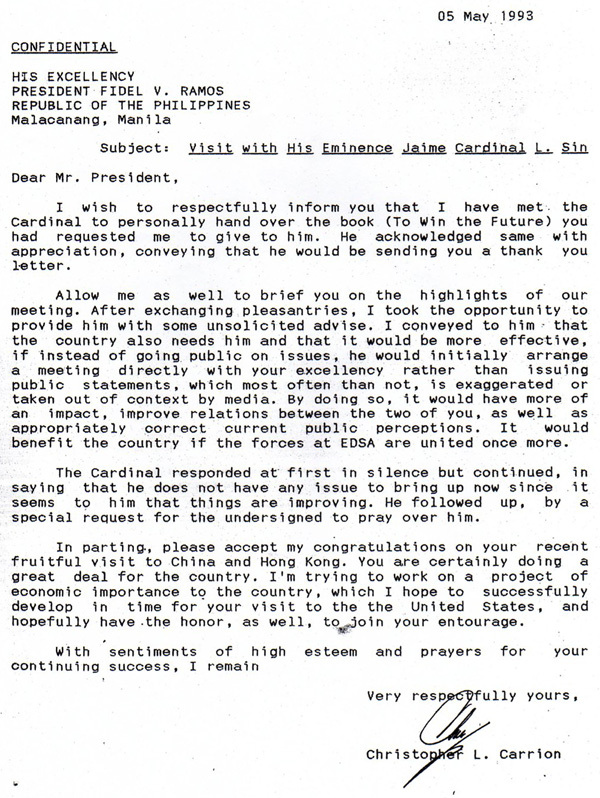 After several meeting that took place between Mrs. Celia Laurel, Don Francisco Ortigas, the late Cardinal Jaime Sin, Amb. 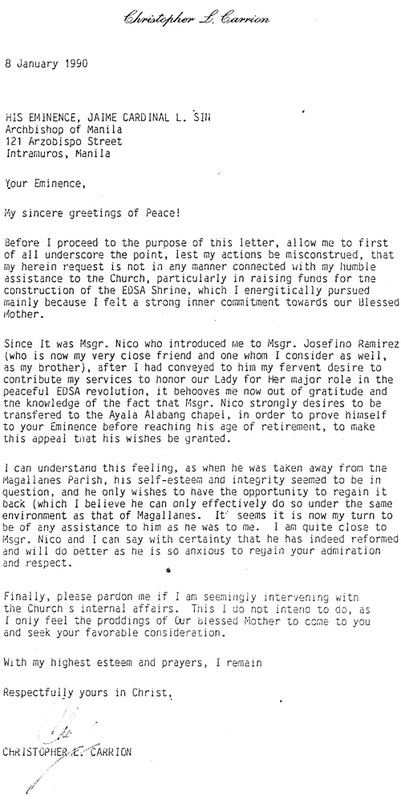 Tita de Villa, Don Joaquin “Chino” Roces, Msgr. 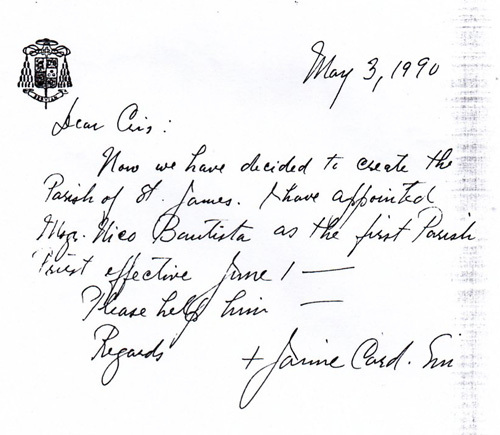 Nicanor Bautista, Msgr. 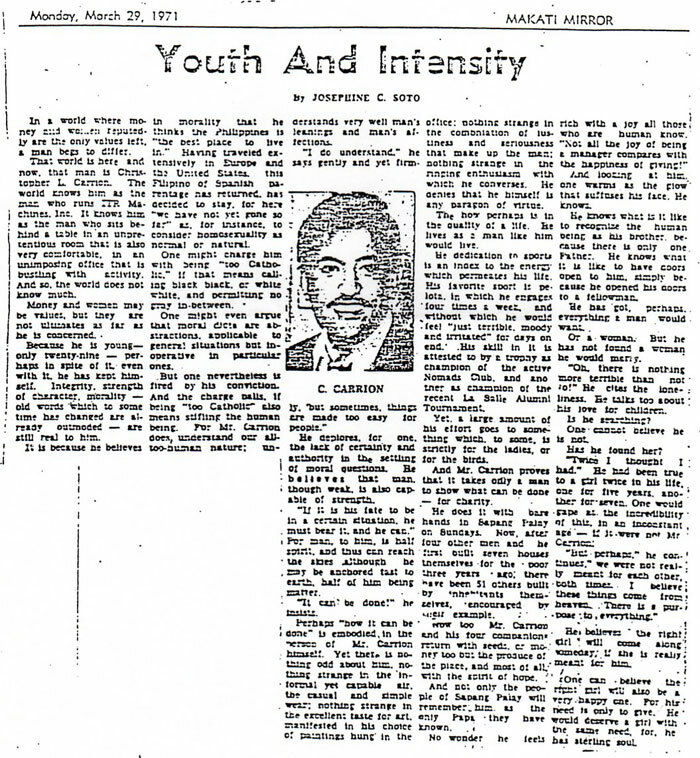 Josefino Ramirez, and many more that were instrumental and played major roles in the said proposal, the construction of the said Church begun with Chris Carrion appointed as the Vice Chairman of the Finance Committee. 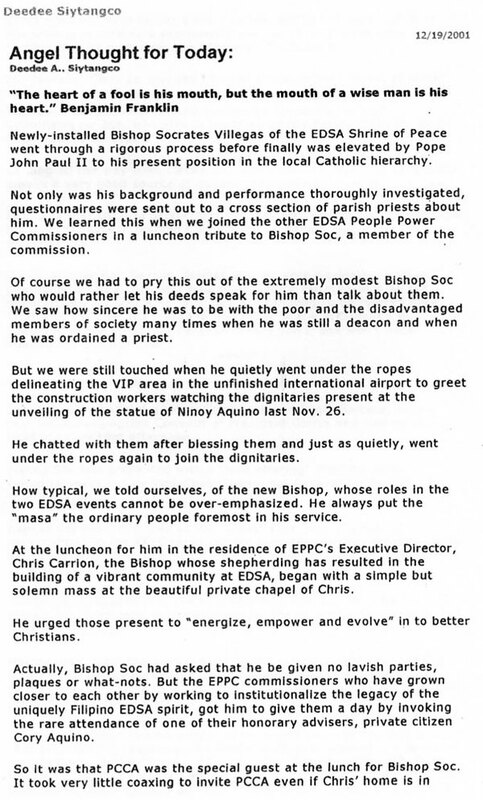 On the fateful day of December 8, 1989 the Our Lady Queen of Peace Church or EDSA Shrine was formally inaugurated with former President Corazon C. Aquino as Guest of Honor and other Government Officials, Church Hierarchy, people from the Business and Private Sectors, and NGO’s. 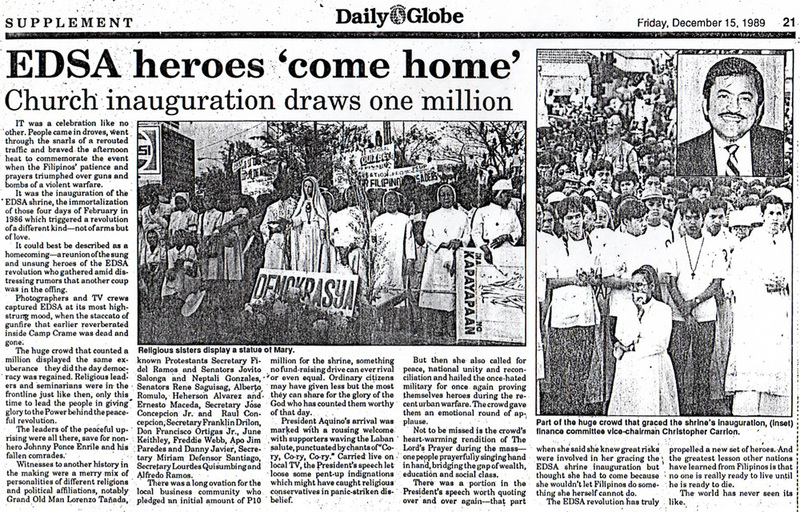 And on December 15, 1989 the solemn dedication of the shrine took place. 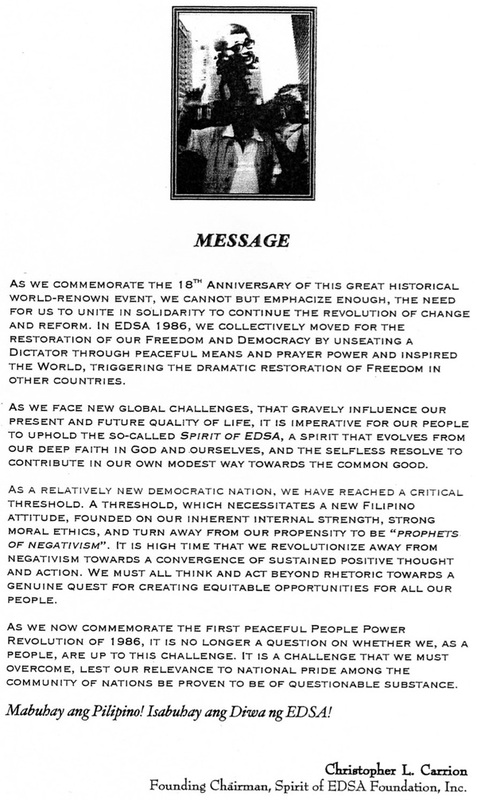 He spearheaded the formation of the Spirit of EDSA Movement to act as a conscience group that would work towards the preservation of the principles of EDSA and the enhancement of the progressive march of continuing reform. 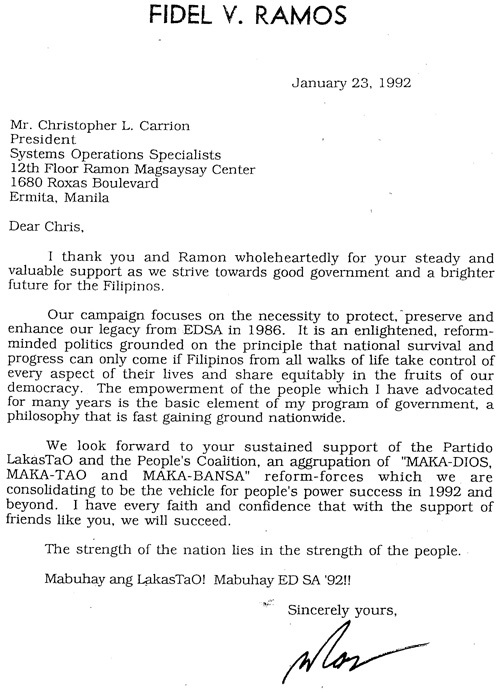 In 1991, the Spirit of EDSA Movement under Chris leadership moved to support and endorse FVR as its candidate for President. 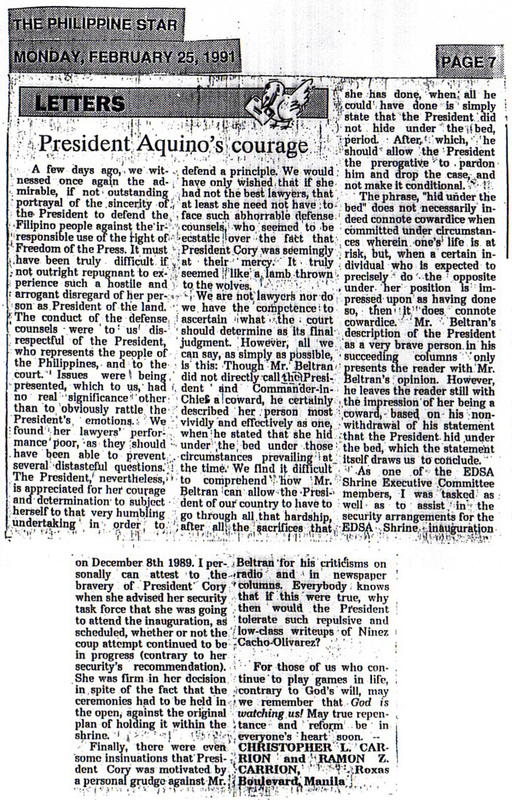 He personnaly wrote several articles in the newspapers and private letters directly sent to President Cory Aquino to help convince her to endorse FVR as her successor, against the advise of her closed friends and relatives who had elected other candidates of choice. 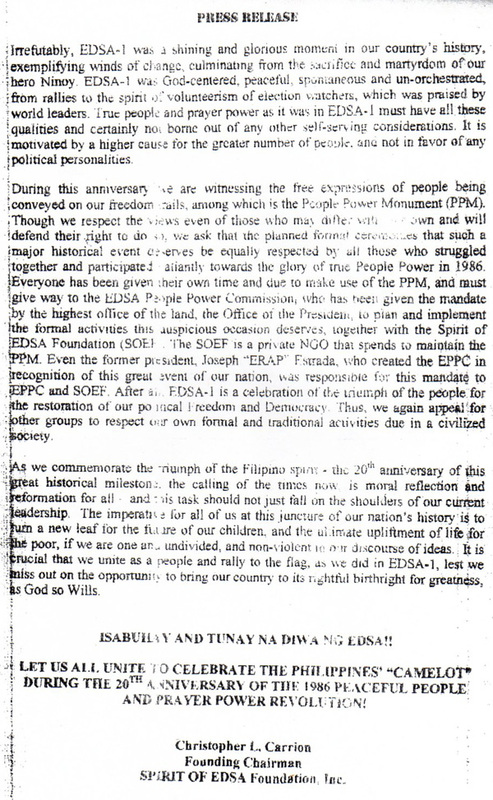 On January 1992, during the much anticipated birthday Mass of President Cory in Malacañang, she had publicly and formally endorsed FVR. 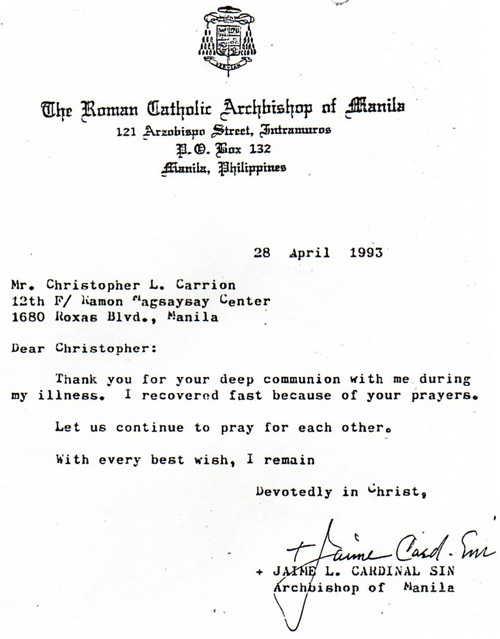 Two days before, her private secretary called Chris to inform him that President Cory had asked him to be her lector during that momentous birthday Mass. 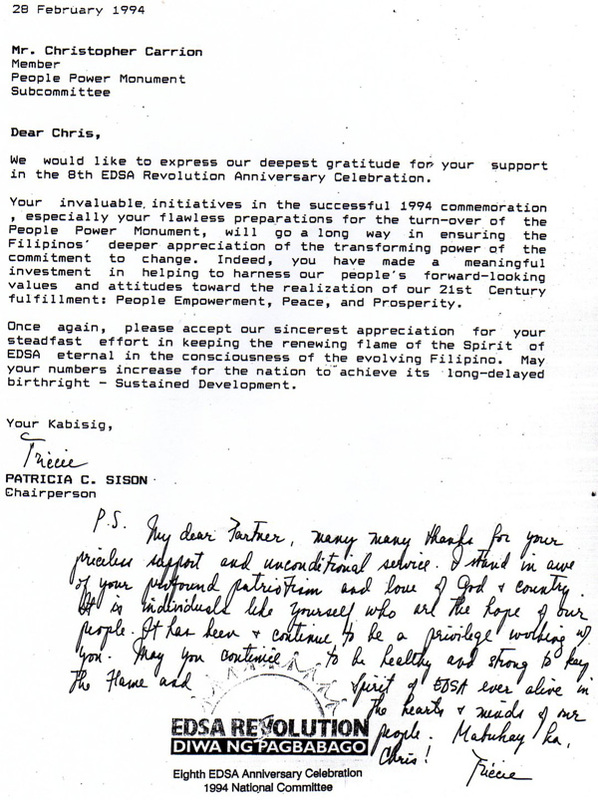 It was enough of a clear indication that FVR was going to be the choice of the President based on highly esteemed offer, but Chris kept the sentiment private and confidential until after the announcement was made. 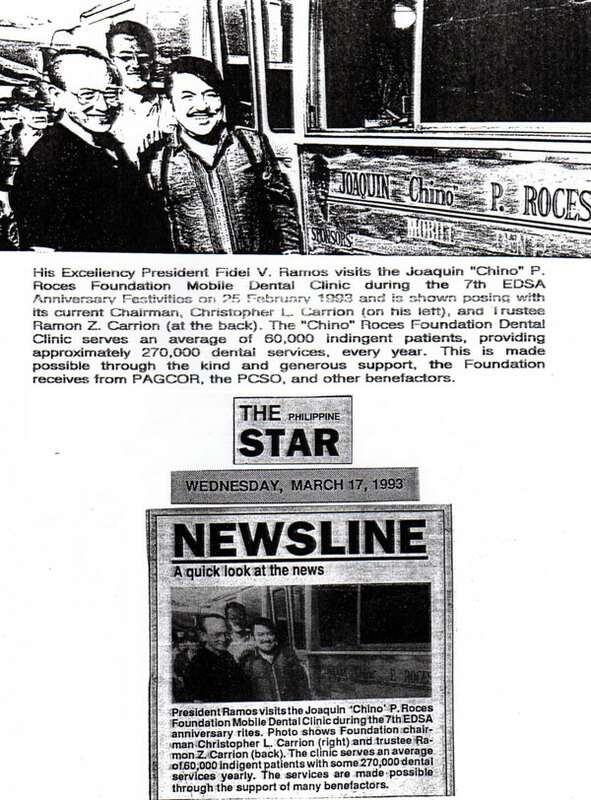 JOAQUIN “Chino” ROCES FOUNDATION, INC. 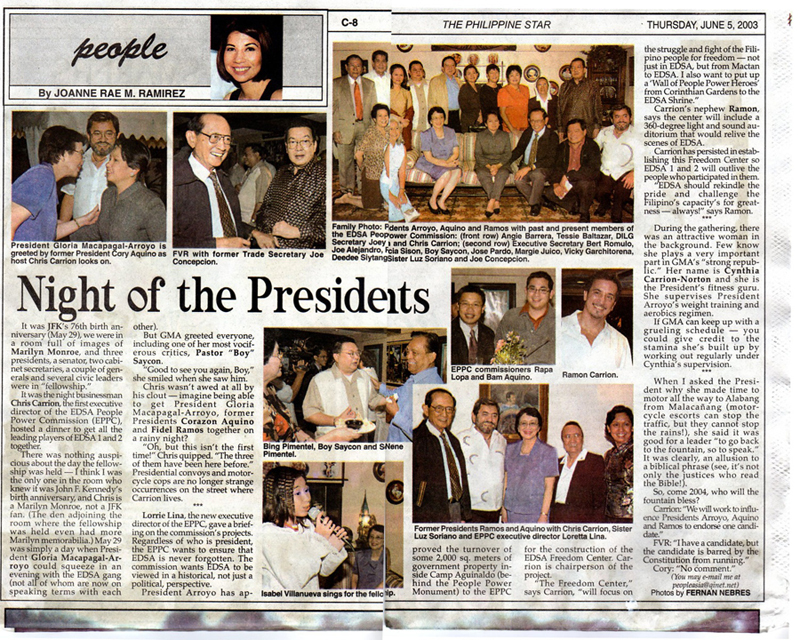 The heirs and children together with the founders of the Foundation invited Chris Carrion to serve as its Chairman together with his nephew, Ramon, as a Director. 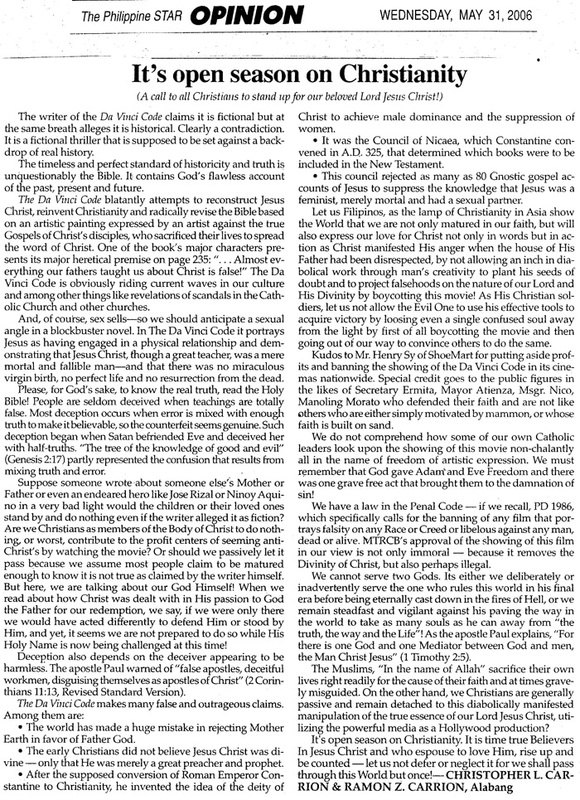 Chris served as Chairman for about two years where the Foundation saw an unprecedented growth in public awareness and charitable social services for the most economically challenged. 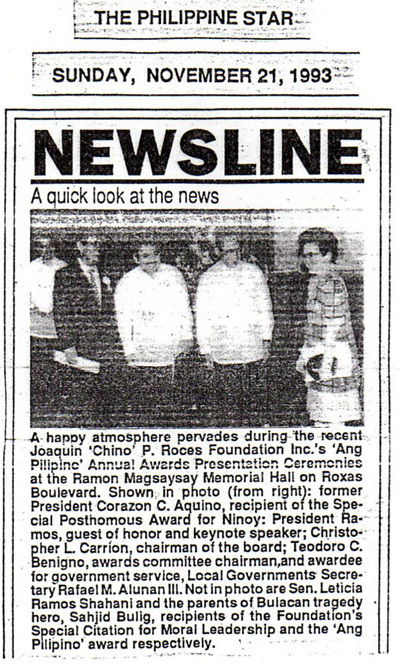 Approximately 200 indigents per day were being serviced by the Mobile Dental buses of the Foundation and a special annual awarding was established with the first Äng Pilipino”Award participated by President Ramos and former President Aquino in attendance in one momentous evening at the Ramon Magsaysay Center in September 30, 1993. 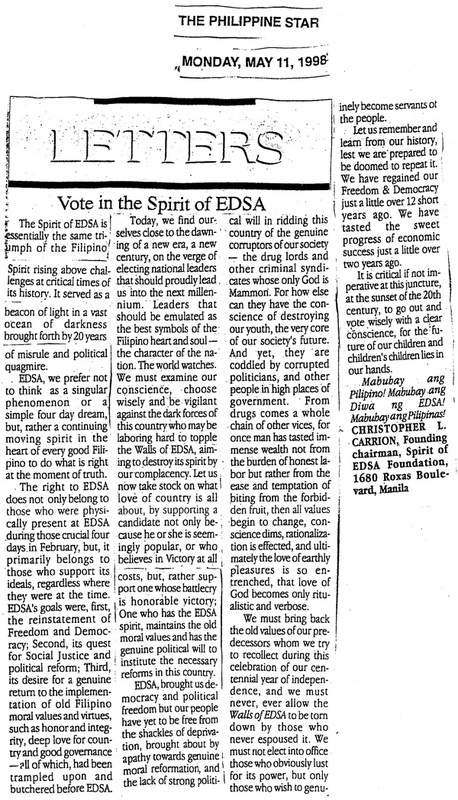 © Copyright Spirit of Edsa Foundation 2010. All Rights Reserved.